Quick aside: the recent posts about Rust have done very well. Enough that some of you are probably following the RSS feed just for that. I'm going to try and link some interesting Rust posts if I'm writing about a different topic that month. Today, Bryan Cantrill Falling in love with Rust. Both good introductory links and extensive thoughts on why Rust is worth caring about. On to the main topic: Games are increasingly being updated after release as part of a "living game" strategy to continue to sell the game and any additional content. This is nothing new except in how common it has become. Back at the tail of the 1990s, if you wanted players to keep coming back and knew that the internet was now good enough to distribute patches then free content was how you drove sales and interest between boxed expansions. Total Annihilation was offering optional additional units back in 1997 on top of the balance patches and we'd come to each LAN and make sure everyone was up to date before jumping into the game. TA wasn't the first game to do it but additional maps, scenarios, and units was still notable in 1997 and became more common as games embraced online multiplayer as a primary focus (eg Quake 3 and Unreal Tournament). Even things like mods are part of this, being community-developed free DLC. Counter-Strike drove Half-Life sales at the development cost of building and maintaining those mod tools (which had originally been used to develop the game). A decade later and consoles embraced online balance and even feature patches to expand games and eventually started pushing paid piecemeal DLC that wasn't just a different way to buy those traditional boxed expansion releases. Fancy buying a single new item for your RPG? What if you paid for it? What if you paid enough that, at those prices, a full game would cost at least several thousand dollars to buy? Hello the pricing model of many current F2P titles which offer to sell content (beyond the model that just sell temporary cheat codes to skip the most grinding activities or boost your stats). Today, paid DLC of all types (from cheat codes to full expansions that massively extend the volume of content in the game) is everywhere. In a change from those original online games, multiplayer modes often sell additional maps which require you to keep paying to continue to play the current rotation of popular maps, somewhat like how MMOs require continued payments. But things are starting to swing back the other way with cosmetics being sold while the maps are given away to everyone who paid for the base game so they can continue to play. As someone with an interest in the longevity of the industry, I really hope this swing back continues. We need to delight customers, to make them feel like they got more than they expected. If we are making living games, we should avoid making things that feel like you've purchased a $60 storefront that's constantly asking for money rather than offering enjoyment. Over the last year, my feelings on two console exclusive (formerly tent-pole?) driving games have really driven this home. I may have played more hours of Forza Motorsport 7 in the last year than GT Sport but by the end of Forza, I felt it was a slog; I saw the treadmill and only the proximity of the finish line kept me even considering continuing the career mode. I had access to over 500 of the 700 cars the game launched with; I'd become familiar with all 32 locations; but I had zero interest in paying for more cars (their plan for DLC). Regular challenges and (eventually) some more substantial patches to add back a working drag mode and fix the track limits were unable to really make me feel like I was engaged with the series continuing. The feast with a list of paid extras just made me feel bloated. Forza was the series that got me to love cockpit mode, assists off, actually feeling like it was driving. But if it wasn't for the rental option then I'd probably not even look at the next release (I'll definitely be playing Forza Horizon 4 as a rental next month - once and done for pennies rather than the increasingly expensive bundled launch day editions that don't even guarantee access to all DLC content over the next year+ of updates; the last Horizon game being unable to run offline on Windows 10 and so effectively being a rental anyway). The monthly FM7 DLCs, heavily advertised in the game and covered in branding for TVs and snack food, offered extra cars on top of already so many, but with an order of magnitude higher price per vehicle and no extra locations. A handful of freebie cars (which appeared later on) are invisible when surrounded by the number the game launched with. But the lock icons stand out, as does the way the Forza series now includes day-one paid DLC in the form of a launch car pack (James Bond cars for Horizon 4) that only the most expensive edition ($100 up front) gets access to. Meanwhile, Gran Turismo launched with under 200 cars (but most of them feeling distinct - no 10 cars just with different advertisers and identical handling/options) and with only 19 locations from which the various tracks (plus reverses) are assembled. A full career mode did not exist at all in the launch game but all of this was clearly messaged in the advertising (and a temporary sale price really helped push it from something ignored to a worthwhile gamble). 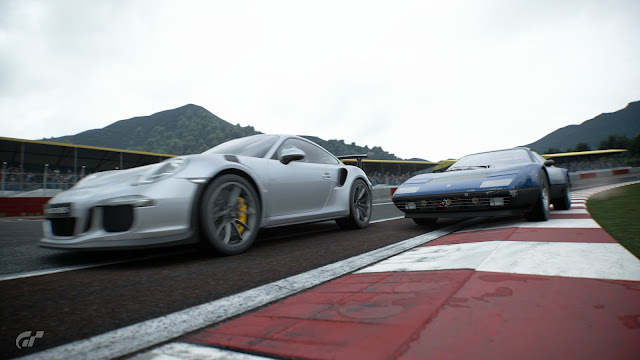 As I talked about in my GotY discussion in December, GT Sport really appealed to me. It also found a way to keep me engaged with monthly free DLC that regularly added a new location and track options plus around a dozen cars each pack. The career mode arrived and every single area of the game received additional attention and content. All for free. While Sony may be holding the next GT game for their next console, I feel extremely positive about the series (and buying that next game) and where it might be going. For a game that launched with less to do but then constantly gave me reasons to come back and try the new additions. The experience was of deciding that the game was probably worth taking a risk on, finding what was purchased was genuinely interesting to me, and then having my interest rewarded in the long term with new content all for the price I'd paid up front. There was enough content at launch, there wasn't a massive treadmill that ever felt full of filler just there to extend the total play time (without the variety to make it interesting), and then when I was ready to go back for more there had been patches that added the more I was looking for and didn't demand additional payments (with the associated question of if that value proposition was better or worse than the one offered by the base game or by choosing a different game). There are many models for how to do this sort of continuous expansion based on player feedback and a long term plan. I'd call almost all games in Early Access an example of releasing a core experience and then iterating and expanding that with an engaged community who expect those additions to be included in the price they paid up front. We have two decades of using the internet to distribute feature patches and new content and how audiences react to that. The Paradox model ties a lot of paid DLC to base game feature patches that expand the core systems so they can milk a release while never letting someone feel like they paid up front for a game and now are left to just watch it progress without them. My experiences certainly make me lean towards saying that a launch game shouldn't try to contain absolutely everything possible with a plan to aggressively monetise post-launch content. The audience will feel fatigued at too much content or start to divide it up into what feels fresh and what feels like filler (and when overwhelmed with content but lacking the tools to understand where it all can fit in as unique, it may increasingly look to be filled with filler). You can't under-deliver but over-delivery at the cost of having content to give away for free during the lifespan of the game feels like something to be considered carefully. The option is always there to push back more for an additional polish pass; rather than monetising it, use it to drive sales of the base game and delight your existing customers.